Director of Operations Kerry Sotelo took the helm at Gods Portion this week. 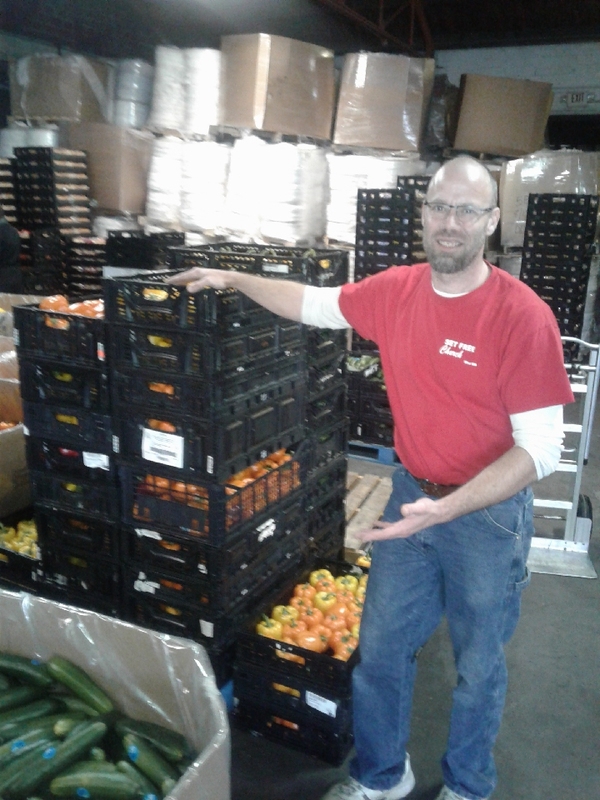 Richard Norton has announced his retirement as director of Centralia-based nonprofit God’s Portion, an organization that supplies local food banks and nonprofits with fresh produce direct from growers and other food. Kerry Sotelo has been named the new director with the title director of operations. 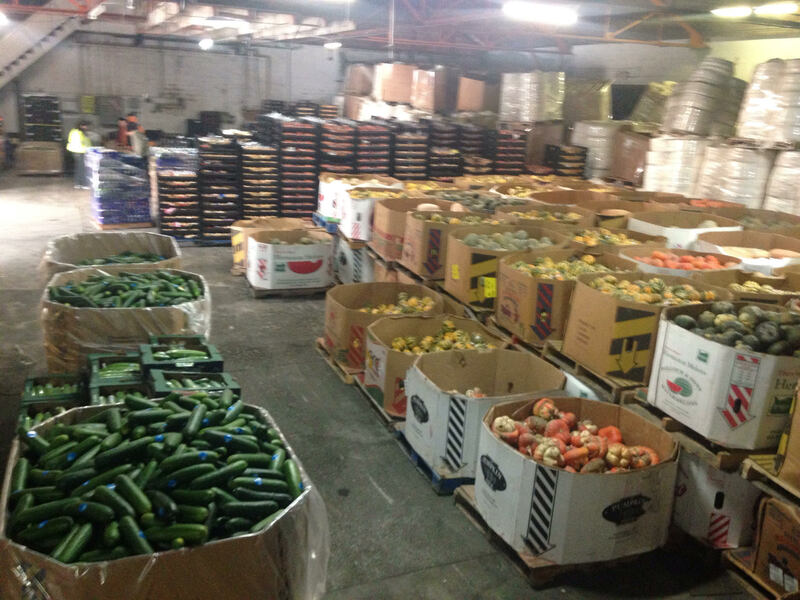 According to Richardson, God’s Portion has more than doubled in annual donations since Richard Norton began serving as director, and the amount of food distributed to local food banks, nonprofits, soup kitchens and other organizations has more than tripled, with nearly 200,000 pounds of fresh produce, bread, chips, and other food passing through the nonprofit monthly. Kerry Sotelo takes the helm with several years of experience serving as operations and warehouse manager for God’s Portion. “Richard gave us a great foundation and I am truly excited to build upon it and take this organization to new heights,” Sotelo said. “Our goals are to expand our volunteer engagement, increase our donations and funding, and reach out to more food banks and nonprofits we can supply with healthy food,” she continued. One of God’s Portion’s partner ministries, the Free Hot Soup program operating out of Gather Church’s Eat Free Cafe in Centralia, use fresh produce which volunteers turn into delicious, healthy soup served with fresh bread. 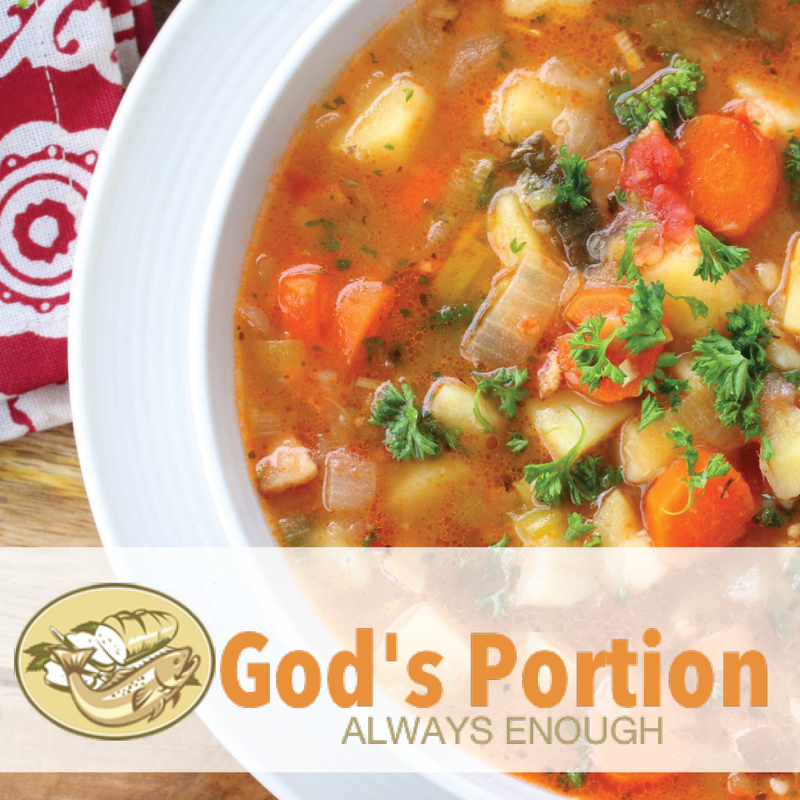 All of the food and ingredients is procured from the God’s Portion warehouse. Free hot soup is a project started by volunteers in Lewis County, originating with a teacher from Adna that handed out a pot of soup in October 2015 at Borst Park several years ago. The program grew and evolved into a Facebook group that got together volunteers to serve hot soup, bread, and later casseroles at the Centralia Train Station twice a week. “About a year and a half ago, we approached the people at Gather Church and started serving there in October 2016 because they have a café on Main Street they’ve been operating, which we now serve out of,” one of the volunteers, Tom, explains. The number of people who dine with them range from 50-100 depending on the time of the month and the weather. “These folks are at a place in their lives where they often need a roof over their head, and are looking for work,” Tom continues. “I think we’re here to make the world a better place, and I enjoy helping others,” he finishes. Tom recommends anyone interested in getting involved should come to Gather Church’s Café on Wednesday evenings between 5-7 to observe, help out with a dinner, or learn about other ways to get involved. The Café is located in The Atrium at 408 W. Main St, Centralia. For additional information, please see Free Hot Soup’s Facebook group. 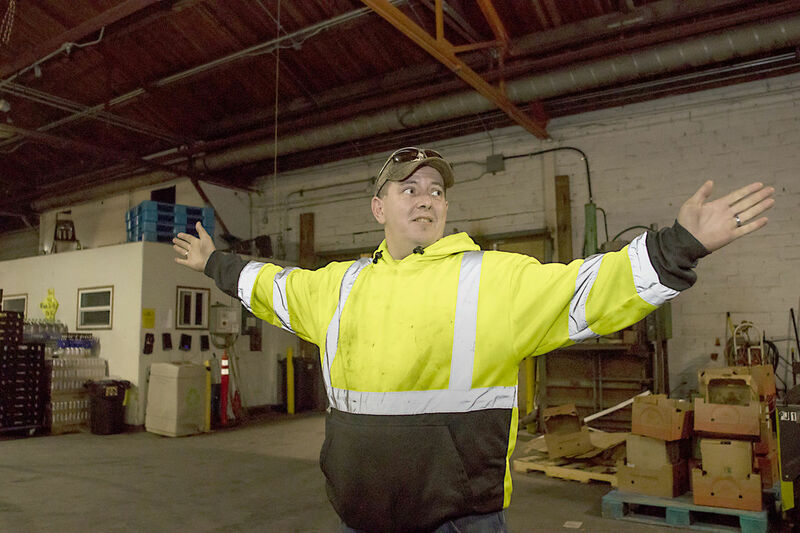 When food banks have taken all they need from the God’s Portion warehouse in Centralia, Richard Graves — better known online as The Chip Guy — and a group of volunteers open the warehouse to the public. The God’s Portion warehouse, located in Centralia, acts as a “food bank for food banks,” Graves said. Companies such as Franz Bakery, Kettle Chips, Green Mountain Coffee and Pepsi donate food and beverages to God’s Portion to be distributed to area food banks each week. However, the companies often donate more than the food banks can accept, whether it’s a matter of having too much of a specific item — such as chips or soda — or taking in too much produce that could in turn go to waste. Water of Life is an independent church not affiliated with any denominations. Donlee notes the church is highly aware of their connection to the greater church community as a whole, and committed to bridging the gap between denominations in the body. The congregation’s desire for fellowship and connection made a relationship with God’s Portion a natural next step. “We’re in a small community in East Gray’s Harbor County, in the city of Oakville,” Donlee says. “Our mission field in Oakville is to spread the gospel, but there’s a looming cloud over the town in the form of drugs and alcohol, and the lack of having a relationship with our Heavenly Father. We’ve been able to reach into the community with our Sunday morning breakfast ministry and also with our food bank,” he continues. Donlee notes the ministry got started as a response to a lack of resources in their area: there was only one food bank in Oakville, and it was only open one day a month. God’s Portion has allowed Donlee and his fellow church members to open a food bank one day every week, and they have partnered with several other ministries to provide food in Chehalis and Elma, as well as the Oakville community. Water of Life provides both perishable and nonperishable goods, with God’s Portion providing all the fresh produce. “Normally at a food bank you see canned goods, and you just don’t see a lot of fruits and vegetables,” Donlee explains. “It’s an opportunity to educate people how to eat healthier and a lot of people in our community have really learned a lot about cooking fresh and natural food, and it’s just wonderful to see their eyes opened up to a better way of living,” he says. For more about Water of Life, click here. Donate now and support God’s Portion in providing food for Water of Life and other ministries: click here.